The Early Show correspondent Melinda Murphy pulled one plum assignment when she cruised the Caribbean on the newly refurbished ship QE2. Her goal was to meet some rather special gentlemen, who know what it takes to please a lady. Thejob of these gentlemen is to ask the gals to dance. Light footed, debonair guys called "gentlemen hosts" are paid just under $30 a day to cruise the world on luxury liners like the world-famous Queen Elizabeth 2. In exchange, they have to dance with the single ladies to music ranging from from free-style disco to ballroom. Tourist Patricia Wharton says, "I think when you're a woman on your own, it's really nice that a gentleman will come and ask you to dance." That's because there are lots more ladies than gents on board most cruise ships. And some of the single guys who do come along for the ride would rather dance to their own beat. The gentlemen hosts, though, are a more conventional bunch. Why do they do it? Gentleman host Tanny simply says, "I love to dance." And he's good at it too. Of course, it takes work to be a sea-legged Fred Astaire. Bert and Alan are also among the six hosts on this particular QE2 cruise. To get this gig, they had to be between the ages of 45 and 72, single and ready to rumba. As they get ready in their cabin putting on their black bowties, they say to each other, "You ready? Let's do it!" But this job involves more than just knowing the right steps. It's also about knowing the right words. Alan says, "You have to be a little bit of a social worker, in a way. You know, I think people just want to be held. I know I do. And some of these ladies have been alone a long time and they're just really happy to dance with me and I'm happy to dance with them." A woman named Darlene says, "I'm a widow. And I love to dance. I love to move. And I don't know what I'd do without somebody to dance with." And that's all there is to it - really. Romancing the ladies is strictly forbidden by the company. Besides, just because they're single doesn't mean they're available. Bert says, "I have a lady friend at home who also thinks it's great." He says his girlfriend understands his job "because what we're doing is a working vacation. We're out to dance with the ladies and make sure they have a good time. And of course, that's where it stays." And that's just fine with the ladies. They know all about the gentlemen host program. Alice says it makes all the difference, "because I love to dance. 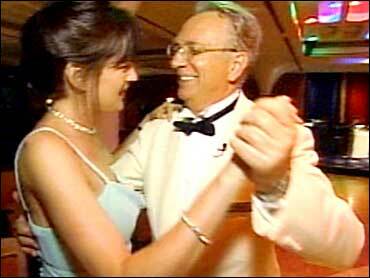 If they weren't on, I wouldn't come," she says, "because I want to dance and if I have nobody to dance with then..."
Arlene Heinz from Toronto says, "When you're by yourself, it is nice to have someone to dance with." When asked if the hosts are good dancers she says laughing, "Most of them. But they're nice men. They're gentlemen." Gentlemen who have all passed a test, proving they can hoof their way through way at least five different dances. Generally, the men don't teach the moves. The ladies learn steps in the afternoon classes, which the hosts also attend. Murphy gave it a try and as she stumbled, she found out some need more help than others. And then the ladies practice what they've learned at night - but each man can only dance with one gal for one dance until each woman has taken a whirl. These guys are gentlemen to the very end - even after the music stops. Even though it's not in their job description, they'll accompany the ladies to the midnight buffet or even to the disco for more dancing on top of their four-hour daily dance requirement. Not a bad gig, eh? Dancing your way around the world, all while making ladies feel young at heart. The QE2 isn't the only cruise line with gentlemen hosts. In fact there are more than 20 different companies that offer this service.